These are the tools that I use and that I recommend for self-treatment trigger point therapy. They are not the only massage tools that work for trigger point work, but they are the best that I’ve found so far. They’re designed to have the same firmness as the human hand (the original and best “massage tool”). The company is TriggerPoint. You can purchase the products various places online, however, in full disclosure, if you use the links on this page to make your purchase, I do receive a small commission on the sale. For questions, feel free to contact me. If you have mainly foot, ankle, or calve issues, this gives you the most important tools for those “foundation” issues. This kit includes the FootBaller small roller, 2 Massage Balls, the Baller Block, and access to the online video portal. The most versatile tool, and an important supplement to the QuadBaller, the Massage Ball gives great targeted relief to calves, feet, chest, abdominals, glutes, upper and lower back, shoulders, and pretty much anywhere else. This ball is 2.6 inches in diameter–approximately the size of a tennis ball–but it gives exactly the correct amount of firmness for adequately addressing stubborn trigger points. Tennis balls can be used in a pinch, but they tend to be a bit too soft, raquetballs a bit too hard. As with all the other TriggerPoint tools on this page, these are designed to have the same firmness as the human hand. 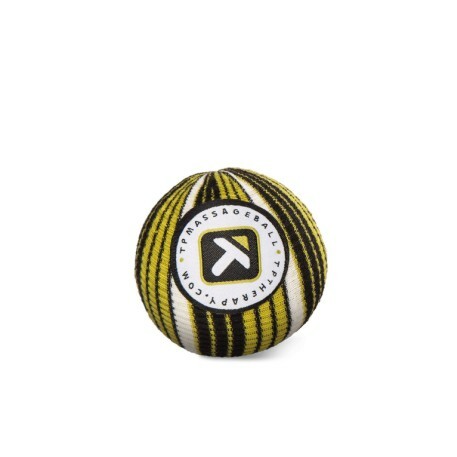 A larger ball for addressing bigger areas, the MB5 Ball is 5 inches in diameter. I find a larger ball to be particularly helpful for hip and glute issues, but it can also be used for abdominals, legs, and many other areas as well. This is the reference handbook for self-applied trigger point therapy. The first part of the book gives a brief history of the research and the science behind trigger points–what they are, how they form, the problems they cause, and various means for treatment. It also gives basic guidelines for tracking them down and treating them yourself. The rest of the book is an extremely valuable reference for identifying where trigger points are most likely to be found based on and related to specific symptoms, as well as tips for treating them. This book goes beyond just a focus on trigger points and covers the science behind the idea that “sitting is the new smoking”–and they’re NOT kidding. There are a plethora of damaging health issues that arise from the habit of sitting too much on a daily basis. Shortly after reading this book, I switched over to a standing work station (which is where I am this moment as I’m writing this) for my computer. He also covers a wide range of information on alleviating some of the issues if you must sit, how to convert to a standing work station, exercises, and yes, trigger point therapy, for addressing many of the issues of sitting too much. He also covers basics on how to better align and use your body to avoid issues in the first place. I’ve been practicing and teaching movement disciplines for over 40 years, and this (and the following book) is some of the best information I’ve found on using and treating your body more effectively. Similar to Deskbound, this book covers alignment issues, resolving pain, and preventing injury. Supple Leopard is a bit more focussed on athletic performance and less on the hazards of sitting. I can’t say enough about Kelly Starrett and the information he is making available. In my view it combines the science and knowledge from physical therapy, trigger point therapy, peak athletic performance, yoga, tai chi, and many, many other disciplines.